It looks like summer is back with people in flip-flops and shorts again. Unfortunately, it is not going to stay. We are going to get hit with a little dump of rain on Sunday and the temperature will cool. That said it should be back to sun and 14 degrees next week which as far and we are concerned is perfect fall fishing weather. The river fishing continues to improve. 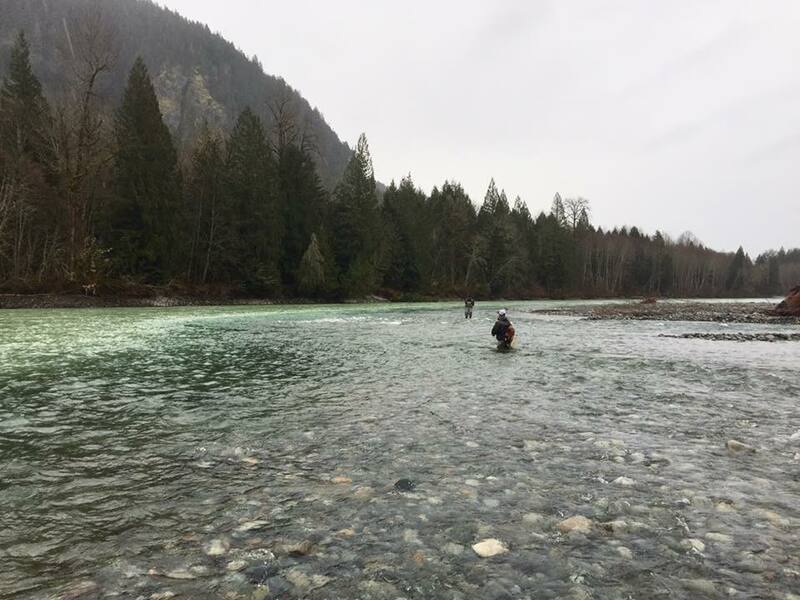 We have heard great reports from the Vedder and fish are showing up on the Stave and Harrison and are coming in to the Squamish. The heat this week did affect some of the coastal rivers such as the Squamish. If it gets too hot they get a bump of dirty water from snowmelt and the water colours up. Good reports are also coming off the rivers north of Whistler. Though we do not report on them all the time we thought to add some spice to the report this week. We have a look at the lower Lillooet river and surrounding area. It is a great option to combine with a lake trip if you are in the area, a long day trip, or if you’ve got a spot in Whistler. Check out all of the details below in our Freshwater Report Section this week. Out on the saltchuk we have been staying close to home, fishing the Cap Mouth or chasing coho off of Stanley Park. Fishing has been consistent but seems a bit slower than normal for this time of year but that can change at any time. 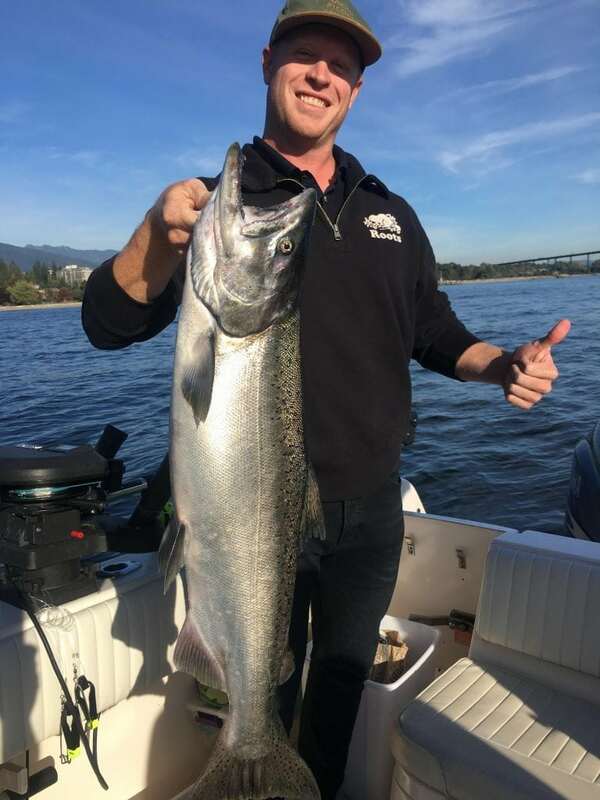 Jason has more details in this week’s Vancouver Saltwater Salmon Fishing Report. Lake fishing is another great option this time of year. When you have weather like we have been having with warm days and cool night in the end of September this fishing can be epic. We have a little report on the basics for lake fishing and you will want to get out now before it gets cold. 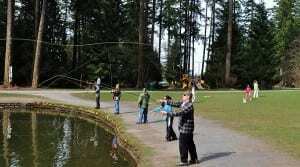 This course was specifically designed to give the new fly fisher the basic knowledge, casting skills and fly fishing strategies to effectively fish our local BC waters. This course is comprised of two sessions; 3hr evening seminar and a 3hr casting session. Seminar & Guided Walk’n Wade Cost: $250.00+GST per angler, minimum of 2 anglers per guided day on the water. 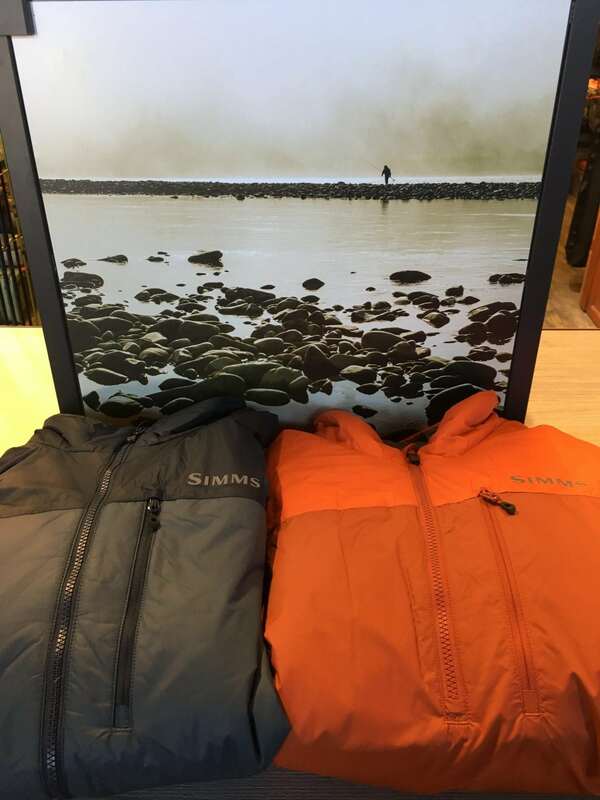 New for this fall from Simms is the Midstream Insulated Jacket – a simple yet technical piece for those anglers who want to stay warm without adding bulk, but is also stylish enough to wear to the bar afterwards to warm up. It’s not a secret that those who layer properly for the elements end up fishing more effectively and strategically, as they do not have to worry about temperatures and comfort. That said it can sometimes be easy to layer up too much, adding unnecessary weight to the body or pack if you’re planning for a few days. With that in mind, Simms introduces the new Midstream Insulated Jacket featuring PrimaLoft Gold insulation for the highest warmth-to-weight ratio available in a synthetic. With its thin profile and lightweight feel, this jacket will keep you moving and casting with ease, without the feeling of being over-layered or restricted. Keeping it all together, Simms uses a new Pertex face for wind resistance and a smooth finish- making it easy to slide in and out of waders without bunching up. To make this jacket thin, light, and warm, Simms uses 60g from PrimaLoft gold in the body and 40g in the sleeve, making sure it keeps your core warm while not weighing down your arms for casting. The wind-resistant Pertex fabric on the outside uses Pertex Microlight 30D, and features two zippered hand-warmer pockets. If you’re interested in one of these unique layering pieces, or any other similar item, come on in to the shop- I’d love to geek out with you on gear! Well in case you didn’t know, the Interior Fraser Steelhead (Thompson and Chilcotin) are on the brink of extinction with less than a few hundred fish coming back last year on a run that used to be counted in the thousands. This trend has been going on for decades and DFO and MOE has now officially managed these amazing fish down to pretty much zero. As a result, they have closed the Fraser down to salmon fishing (see notices below) to make absolutely sure not a single fish will get hooked if you are bar fishing or tossing spinners or spoons in the Fraser in search of chinook or coho. You would have a better chance at winning the lotto than hooking one of these fish. Despite these odds, and despite the fact it was DFO and MOE management decisions that got us here, the recreational angler is once again shut down. The fact they let these fish get here is a disgrace in itself, but to shut down salmon fishing in the Fraser in the month of October to the very anglers who have fought for these fish for decades is a slap in the face. I would be all for this closure if I thought it would save these fish, but recreational interception of these fish is a negligible factor at best. How many have died in the gill nets in the past 30 years where DFO said it was considered “at acceptable interception levels” and how many positions were cut from MOE this past decade as well. Hard to manage steelhead (which are provincially managed) when all the technicians and biologists that used to be in these management positions are gone while DFO passes the buck as they don’t manage these fish. Subject: FN1071-RECREATIONAL – Salmon – Area 29 – Tidal Waters of the Fraser River – Closure to Salmon Fishing – Effective September 28, 2018. Due to identified conservation concerns, the following closure periods are in place to protect and mitigate potential impacts on Interior Fraser River Steelhead (IFR) Steelhead stocks of concern. Waters: Tidal waters of the Fraser River (downstream edge of the CPR Bridge at Mission to the mouth). Management Measures: Effective September 28 until October 24, 2018, fishing for salmon is not permitted. Subject: FN1070-RECREATIONAL – Salmon – Region 2 – Fraser River – Mission Bridge to Alexandra Bridge – Closure to Salmon Fishing – Effective September 29, 2018. Due to identified conservation concerns, the following closure periods are in place to protect and mitigate potential impacts on Interior Fraser River Steelhead (IFR) Steelhead stocks of concern. Waters: Fraser River in Region 2 (non-tidal waters of the Fraser River). Region 2 waters are those waters between the downstream edge of the CPR bridge at Mission, BC to the downstream side of the Alexandra Bridge. Management Measures: Effective September 29 until October 25, 2018, fishing for salmon is not permitted. Fishing has been decent on the Vedder with a consistent first light bite that is happening. In saying that the water has dropped back down to being low and clear so that will put a minor wrench in productivity. These fish can be caught throughout the day but it is exponentially better at first light. Once the sun comes over the mountain and beats down on the fish they will find refuge in the deepest runs possible and will, for the most part, get a serious case of lockjaw. There are a lot of presentations that are working right now and it is more important to put yourself on top of willing fish. In saying that if you had to bring a few go-to presentations you definitely want to have pro-cured roe, spoons/spinners, and twitching jigs. For the fly guys you will want to fish small so think little Christmas Trees or small sparse flash flies. Flies will have an added advantage at times in these water conditions, as it is much easier to present your hook in a finesse fashion. This coming week should bring some more fish in and if the rain in the forecast can be relied on to bump the water levels we will probably see the first big push of the bulk of the run coming through. The last 2 weeks has been very productive on the Capilano River. The water level went up multiple times and helped the fish shoot up the river. 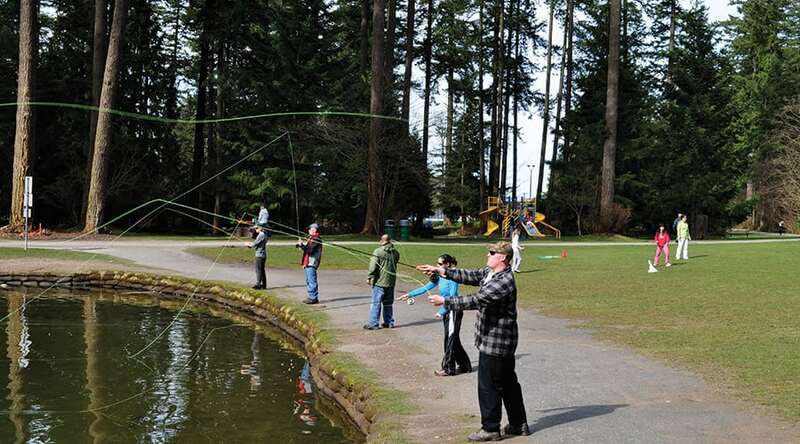 Even with the bait ban, a lot of people were successful getting the fish to bite on their flies, spoons and spinners. Float fishing with jig and egg imitation was also a successful method. The water level is dropping drastically, and because the river has seen a lot of pressure; the report is that fish are starting to be lock-jawed. When the water is low and clear and fish are not biting, we all have to take a different approach. The fish have seen multiple presentations thrown at their face. Just like a pitcher in baseball you have to throw a change up after so many fastballs. So don’t hesitate to change it up. Change your fly pattern to a more natural colour and maybe change the angle of the swing or change up your stripping for more erratic movement. Toss smaller lures so it does not spook the fish in low and clear conditions. Using lighter fluorocarbon will give you better chances. Drifting isn’t the best option as there won’t be enough current. However if you find a nice moving water using clear float will improve your chances. Last but not least, be there at first light. This will be the key to your success as you will be the first on to go through a run on the day and fish might be more aggressive. We’ve noticed the bite turns off as the sun start heating the water up a bit. Please respect other anglers and do not bottom bounce on the river. There are lots of other ethical methods to catch fish but bottom bouncing will ruin everyone else’s day on the small system like this. Please release all steelhead and any wild coho that you encounter. The Squamish is still a bit high, hovering around a 2.8. It spiked over the weekend and then started to drop, looking promising- only to flat line around 2.6-2.8 the past few days. This warmer September weather isn’t helping. If we can get a fairly steady cold snap, it should shape up nicely. That said a few lucky anglers were able to find some fish. 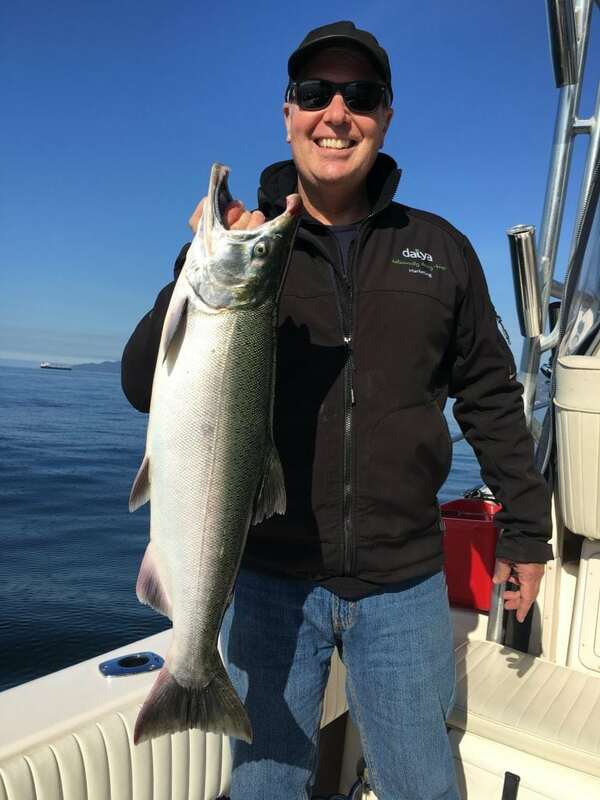 With side channels being their main focus, a couple anglers managed to find a few coho. Again, with this higher, dirty water, larger presentations were the key to success. Large flies and twitching jigs were the ticket. If it starts to drop, scaling things down will start to trend. Spinners, spoons, flies, and jigs all work. Matching colour and size to conditions will be key. Get out there and be safe. This week we are going to feature a little gem that is a bit of a trek but it can be completely worth it if not for the fishing but for the scenery as well. The Lower Lillooet River is starting to see coho show up and with them we will also start to see rainbow, cutthroat and bulltrout hot on their heels. Getting to the Lower Lillooet is a trek but it can be done in a day as Jordan and I have done it in the spring a few years ago while hunting for cutthroat with the Pemberton Fish Finder guys. You need to get to Pemberton to start, it might be worth it to make a weekend out of it and make Pemberton your base camp. Once you hit Pemberton from highway 99 turn east onto Pemberton Portage Road (BC-99 N) and follow it for about 10km until you hit In-SHUCK Forest Service Road. Turn right and follow this along the entire length of Lillooet Lake to the far end where you will find a narrower stretch of water that links Lillooet Lake to Little Lillooet Lake. You can either stay on this side of the lake or cross the bridge to the other side. The Lower Lillooet stretch of river starts from the confluence of Little Lillooet Lake. There is some amazing scenery and stretches of river along the way. Fishing this area you need to think big. There is some big water so bring out the gear rods or your Spey rods. For the gear guys, spoons are king. Gibbs Croc, Kit A Mat and Coho in 55 and 65 size spoons are a go to in Orange or Copper Fire Wing, Blue and Green Illusion or Orange and Silver. For the fly/Spey guys you will want BIG Intruder and marabou flies in Blue/Chartreuse, Orange, Pink and Black. Sink tips will be a must for the water along this stretch of river in 4-7ips 10’ versi tips or 10’ T-11 or T-14. Don’t forget some lighter gear for the trout with your favourite trout beads for fishing the trout holes and smaller water. This is a catch and release fishery so please use single barbless hooks and please release all fish with the utmost care. The scenery on the Lower Lillooet won’t disappoint so please remember if you pack it in, pack it out. 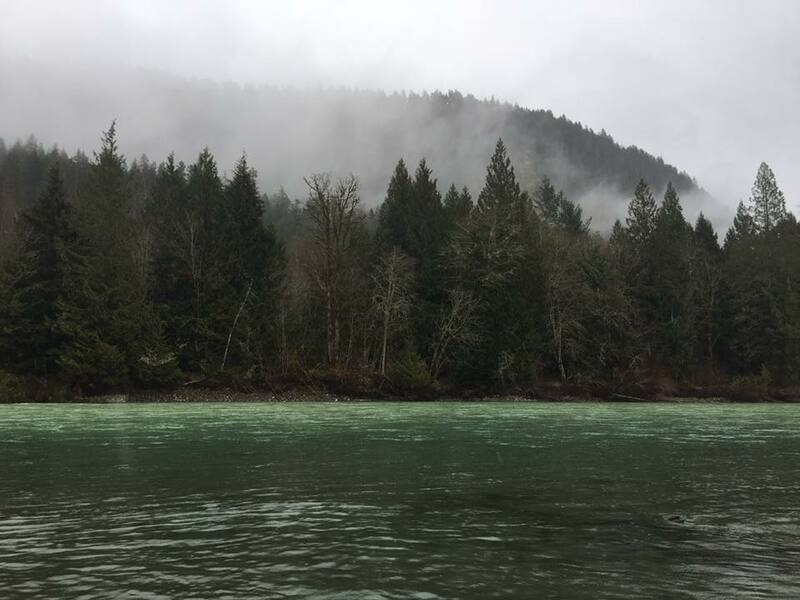 It is still a bit early to anticipate any hot action on the Stave River, but we’ve been seeing a good number of chum salmon in other rivers and we expect the same for the Stave. This would be a great time for some scouting trips and see what’s going on out there. Float fishing jigs is the best method to target the chum and twitching jigs can be also very effective this time of the year when they are not in thick yet. Fly fishing with some popsicle patterns is also very effective. Using a double handed rod can be fun but you might not have enough space, as it is a very popular river. With this warm weather at the end of September it is perfect for lake fishing. 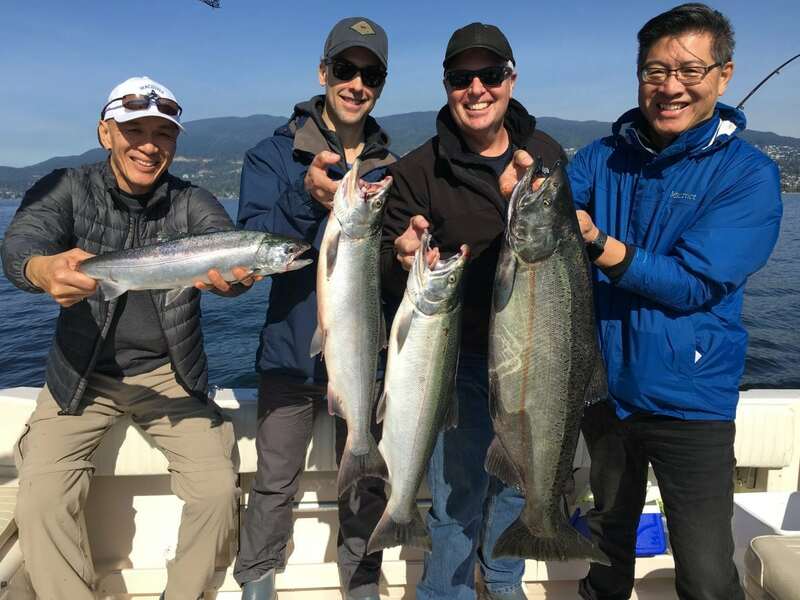 Most new anglers forget about the lakes this time of year but it is debatably the best time to go fly fishing on lakes in the interior and the local lakes around Vancouver are also worth a shot. The dropping temperatures que the fish that winter is coming and they feed aggressively. The temperatures also help with the hot water left over from summer. You will rarely see trout feeding in the shallows in the warm months of the summer because the heat drops the oxygen content. With cooling nights, the fish move into shallower areas and it can make for some interesting fishing. Indicator fishing is still popular with attractor style balanced leaches or shrimp patterns but many anglers focus on the 10-20 foot deep drop offs and fish sinking lines. In this depth you might not necessarily be sight fishing the entire time but if you can anchor the boat with on side to the shallows where you can see the bottom and one side to the drop of where you can see the bottom and fish both. The staple food this time of year are things the trout can bulk up on. Shrimp, leaches and water boatmen are all on the menu. You will want all of these in your box but your go to attractors also work every well this time of year because the fish are hungry. For gear, if you want to focus on the shallows an intermediate line is the perfect line to cover 5-15 feet of water. Guys will also indicator fish these depts. With short leaders and a floating line. Lastly have something very heavy in the arsenal. A type 6 line is good for trolling and searching but you can also use it in the shallows with patterns that have bouncy. Fishing booby patterns and floating dragons in the shallows with a heavy line right on the bottom can be a very effective late season method. Come down to the shop if you have any questions or need spots to try. This past week we have been focusing our efforts close to home, which is always nice after a long season of running to the Gulf Islands in the spring and the South Arm in the summer. 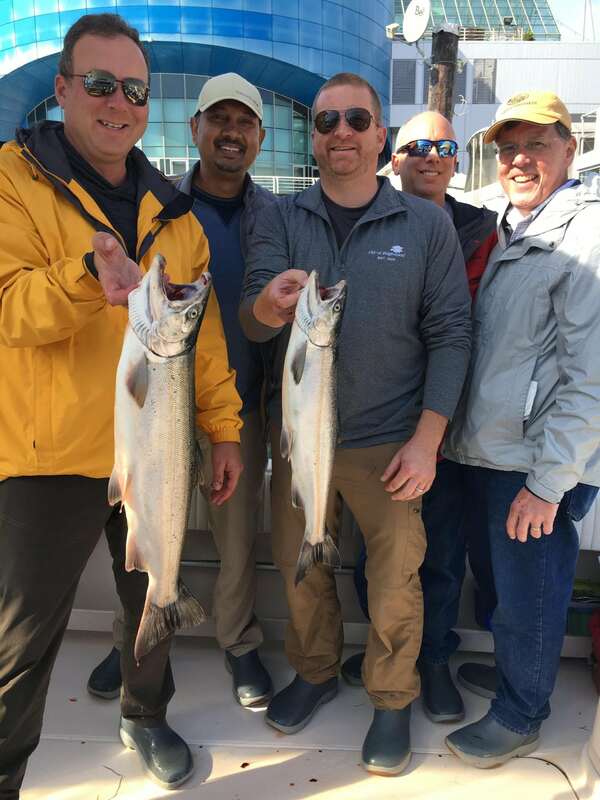 Some Cap coho caught this week! Fishing on Friday last week for the DNV derby was good at the Cap Mouth. We went 4/7 on chinook, but no derby winners for us. The hot combo for us was a purple Phantom flasher, 7-foot leader, and Rhys Davis anchovy teaser head in blue/green glow with a 5.5-inch anchovy. Thanks again to all who made this derby possible. I hear it was quite successful and they raised a lot of money for their two charities, the Seymour Salmonid Society and Athletics for Kids. 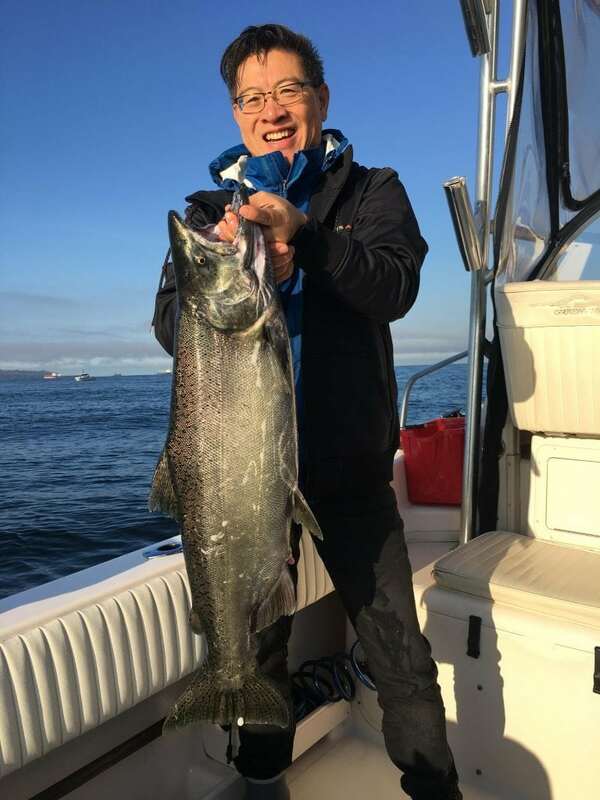 There were just over 100 chinook weighed in, so the fishing was understandably slow on the weekend as most of the fish in the area were harvested or hooked. The rains we had also raised the level of the Capilano River and some coho and chinook did finally decide to go up the river. The chinook fishing at the Cap Mouth did pick up slightly mid-week, but right now I would call it a little slower than normal for the last week in September. This can change on any flood tide, so I don’t think it is over yet, there will be some more fish pushing in. We might see some more fish stack up off the Cap Mouth on this low pressure system that is about to come in. There is some heavy rain forecast for Sunday, hopefully just enough to get all the fish concentrated off the river mouth, but no so much that they all go up the river! After this weekends rain it looks like the high pressure ridge is back and so are the sunny skies. 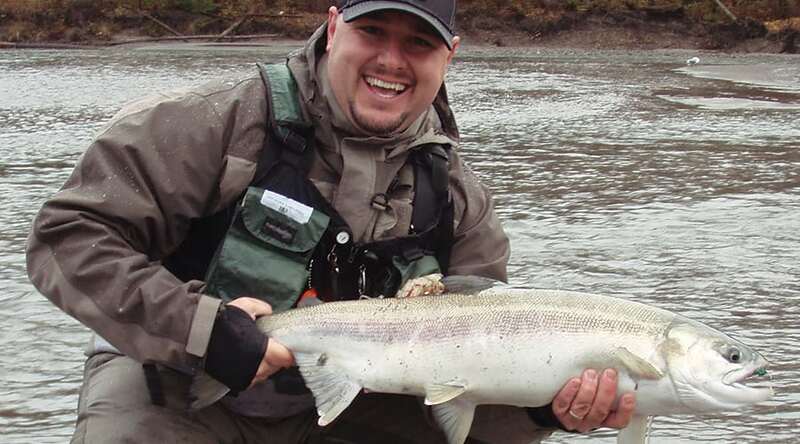 The river should stay low and any chinook showing up in the first week of October will be forced to sit off the river mouth until the next heavy rain fall. 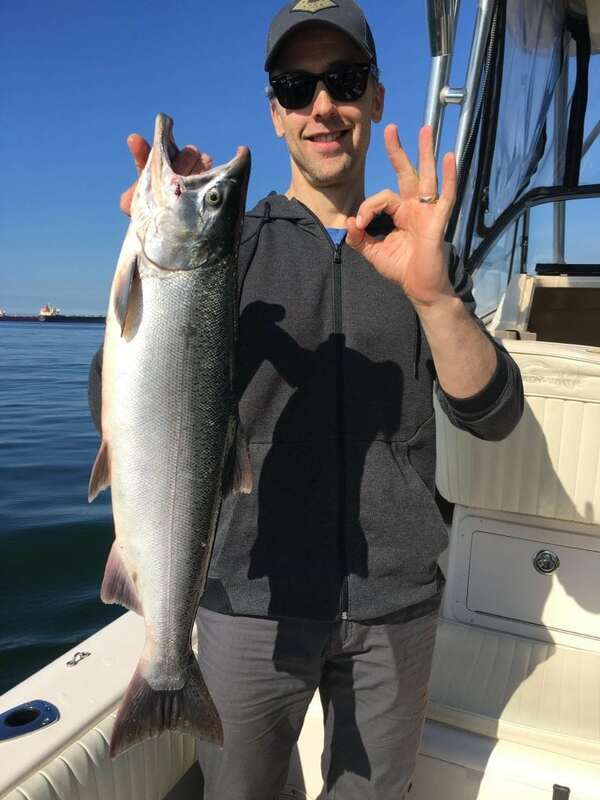 In case you haven’t heard about it or seen them jumping, there have been good numbers of coho stacked up off Stanley Park for the better part of 6 weeks now. The numbers have greatly diminished with the Cap river levels coming up this past week, but there are still a few stragglers around. Although these fish are notorious for having lock jaw this time of year, we have been able to get a few to bite when we have put in the time. Productive flashers have been silver or gold Betsy with a 6-foot leader to a 3.0 or 3.5 Kingfisher spoon in Bob Marley, Killy McGee or Maverick with Skinny G and Coho Killer spoons in similar colours also working well (nickel finishes with green or blue on them). If you are looking to avoid the Cap Mouth crowds, another option would be to hit the South Arm in search of some late white springs headed to the Vedder/Chilliwack or Harrison and some coho as well. As we get into October we enter the peak migration period for thousands of coho heading to rivers like the Chehalis and Vedder/Chilliwack just to name a few. You can keep hatchery coho only. White hootchies or bait has always produced well for me when I do get the chance to troll down south in October and if you hit it right you can have a lot of action and there are very few boats.